The BYOD4Learning course has been developed by Educational Developers Chrissi Nerantzi and Sue Beckingham. The original developers of the pedagogical design COOL FISh are Chrissi Nerantzi (MMU, UK) and Lars Uhlin (Karolinska Institutet, Sweden) which was developed and used in the open FDOL course available under a creative commons share alike licence and specifically for #FDOL131, #FDOL132 and #FDOL141. The design has been adapted loosely to suit BYOD4L earning. And while it has moved away from the more traditional Problem-Based Learning approach towards the concept of individual and collective learning ecologies (we call the design “our magical open box”, see related publication), authentic learning triggers or scenarios are still at the heart of our philosophy combined however with increased flexibility for inquiry-based learning and more choice to make learning happen more naturally, individually and with peers, in cooperation or collaboration with others while also being supported by facilitators when needed. Some of the original resources from the FDOL course have been repurposed for BYOD4Learning and also made available under a Creative Commons licence share alike. If you would like to use any parts of this course, please remember that it is good practice to add the full attribution and link back to the BYOD4Learning site and acknowledge the course designers. BYOD4Learning is for students and teachers who would like to learn more about learning and teaching using smart devices and other digital pocket technologies through an open course/CPD that will enable them connect with peers and learn within a wider learning community. Participants will have the opportunity to engage in a series of individual and group tasks and activities with individuals and potentially groups from other institutions and countries. Each topic is introduced via authentic scenarios and these can be used as triggers for exploration and learning. If you participate in BYOD4Learning, you will be able to work autonomously, in self-organised groups or in a facilitated group for the duration of the course or for a specific 5C topic. It is completely up to you. You might want to consider finding a study buddy. We will all come together via Twitter using the hashtag #byod4l where our conversations will happen. Additional community spaces have been set up in Google + and Facebook. It is up to you in which spaces you would like to be present and engage. Feel free to comment on course site posts and create other spaces to capture learning conversations with peers if you wish. Remember, if you are capturing your learning in a portfolio, share this with the rest of the community via Twitter using the course hashtag #BYOD4L, so that others can comment and engage in a conversation with you. It is suggested that groups consist up to 4 members to avoid ‘passengers’ as Phil Race would call them. We would encourage you to learn in mixed groups to enable richer learning, exchange, sharing and critiquing of practice and perspectives. Working practices within the groups should be agreed immediately after formation to maximise engagement and contribution by all group members. Group members should agree working practices and which activities could be carried out collaboratively and how. Consider Problem-Based Learning or Project-Based Learning approach, both represent opportunities for collaborative learning. Consider cooperative learning as an alternative or learning within a discussion group. You might decide to join a specific group for a specific task, this is also possible. Organising a Google +hangout will help you speed up the group working process but it might not always be easy to organise. BYOD4Learning facilitators will also be available to support group activities if needed. If you are interested learning within a group or find a study buddy, please access the Learning Together page for more information. A limited number of facilitated small group spaces are available in Google +. Each group space operates for up to 10 participants and it will be important to commit to working within the group throughout the week if this is the desired mode of participation. BYOD4Learning activities will involve inquiry into your own practice, scenarios and engagement in related discussion, shared reflection and learning through making. You are in the driving seat of your learning and will need to define the intended learning outcomes for each theme by yourself, with your buddy or with your group depending on the mode of participation. Two scenarios per topic have been provided, capturing the student and teacher perspective. Both have been provided in video and text format. Pick the one you would like to investigate on your own or with others. Feel free to add additional scenarios for a specific topic using the comment section on each topic page and use these as a starting point for your investigation and learning if you wish to do so. All activities provided can be done individually or collaboratively. What resources/literature can you use to find answers? How are you going to present and share your findings? Whether and when are you going to meet-up to review progress and complete the any group work? As part of your learning, it is recommended to keep a journal in a portfolio and reflect on your learning experience as you go through the course.Please consider sharing this with the BYOD4Learning community via Twitter using #BYOD4L or in the other discussion spaces. The facilitator will be there to support individual participants, groups and pairs if and when needed throughout the week. All facilitators are from collaborating institutions. The facilitators might be more hands-on at the beginning to help you co-ordinate the initial activities so that you can get started. Progressively, the facilitators will step back and let individuals and groups/pairs decide when they need his/her help. If you need help, please let the facilitators know via Twitter using the hashtag #byod4lHELP. Additional colleagues from other institutions have decided to join the BYOD4L team to support participants in their learning. Their engagement might be more sporadic and not necessarily on all days of the week. We based our BYOD4Learning course very loosely on Inquiry-Based Learning and particularly on Problem-Based Learning which is a more structured collaborative approach and used with small groups. Mills (2006) 5-step model has been simplified further and been named FISh (Nerantzi & Uhlin, 2012; Nerantzi, in print). 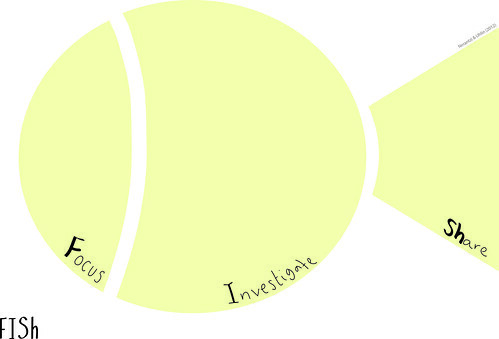 Within BYOD4Learning we suggest the use of FISh for flexible learning based on a simple process and loose structure. Even if you learn autonomously or with a learning buddy, FISh might help you keep on track and make progress with your learning. However, remember that learning is messy and following or restricting yourself to a linear process might not work and can be frustrating at times. FISh by Chrissi Nerantzi and Lars Uhlin (2012) is licensed under a Creative Commons Attribution-ShareAlike 4.0 International License. Any questions, please let us know. Thank you.